Amy Pellegrini began writing professionally in 2005 and has since published various articles, press releases, blogs, poems and features on a number of topics. Pellegrini holds a Bachelor of Science in journalism from California Polytechnic State University in San Luis Obispo, Calif.
Aloe vera has a number of medicinal and cosmetic purposes, as it is effective in soothing the skin and reducing inflammation, according to Aloe-Vera-Research.org. Aloe vera comes from the aloe vera plant but is typically sold as a topical solution that is used for sunburns, rashes, acne and overall skin health. Its healing properties come from the 18 amino acids it contains. Sunburn damages the skin. It ages the face and can even lead to skin cancer, according to the website ayushveda.com. Facial sunburns can cause inflammation, puffiness and breakouts, so treatment with healing remedies such as aloe vera is important. Aloe vera has an immediate cooling effect, and it forms a protective layer that seals in moisture to prevent dehydration and promote healing, according to the website LifeTips. Aloe vera helps to counteract infection, according to Health911.com. 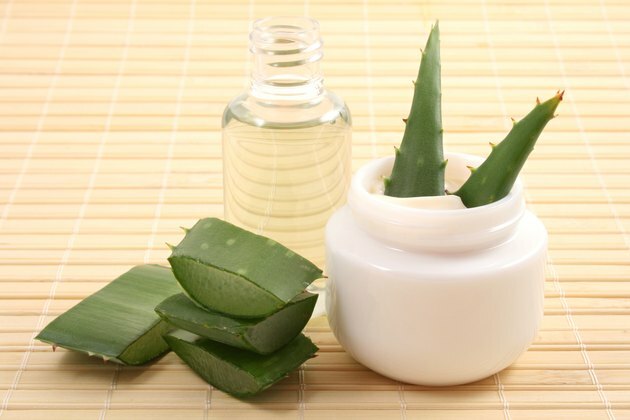 Used on pimples, sores and acne scars, aloe vera improves complexion and color. It stimulates new cell growth and the healing of scars. Aloe vera is considered an excellent skin cleanser and contains antibiotics, coagulating agents, pain inhibitors and astringents. Aloe vera helps to reduce the appearance of facial wrinkles, according to the website TheSkinWrinkles.com. Aloe vera works by increasing the skin's elasticity to keep wrinkles from developing. Aloe vera is also rich in anti-oxidants. When your face is constantly exposed to sunlight, it is also exposed to free radicals, which contribute to aging. The anti-oxidants in aloe vera neutralize the harmful effects of free radicals, thus protecting against and reducing the appearance of wrinkles on the face. Aloe Vera Research: Aloe Vera...Myth or Medicine? Does Lemon Juice Work on Scarring? What Are the Benefits of Aloe Vera Gel Around the Eyes?